It hurts my heart to say this, but Suddenly One Summer is one of the biggest disappointments I have ever received, especially since Julie James is one of my favorite, most trusted authors - I expect so much from her, but this time, she didn't deliver. James's books usually stand out from the everyday contemporary romance in that they're not cliché, and there's more to it than just the attraction. I know I'm not putting it into words well, but there's just something about her books that pull you in and don't let go. It's not just the regular boy-meets-girl thing; there's usually more to it. Unfortunately, this novel turned out to be nothing but run of the mill. There was nothing special about it besides a quick foray into some psychological problems, and even that didn't have a significant part in the story, and was only used as an excuse for the main character Victoria's commitment problems and inability to allow people to help her. Another aspect usually shared by James's novels is that her characters are usually either FBI officers or lawyers. In this book, Victoria was a divorce lawyer. Yes, I see you giving me that "oh boy, this is that type of romance book." You're not completely off base, but that's not exactly what happens. Yes, Victoria uses this as another defense against committing to another person, but she also has a backstory that aids with it. What I found annoying is that the words "divorce lawyer" were thrown around at least fifty times in the novel, but in reality, it didn't have a huge part in the plot. Sometimes, it seemed like her profession was mentioned so much simply so the reader got the idea that this book fit in with the rest of James's books. I really didn't appreciate that since I'm so used to the character's profession usually having an important part in the plot, even if it is just a side plot next to the romance. Now, Victoria's "divorce lawyer" status did have a part in a side plot regarding Ford's sister (Ford is the love interest), but I feel like, again, this plot was just for show. For one, it's the thing that moved Ford and Victoria from the I hate you category to the hmm, I might actually like you state of mind. I wouldn't have even minded it that much, except for the fact that Ford's sister's problem had much too simple of an end - something I noticed in the author's last novel as well. This perfect and unrealistic finish to the sister's situation made her story seem like a failed attempt to get the reader to think that this book isn't your ordinary contemporary romance. It's too bad it was. An additional failing I found with James's latest novel is that Ford didn't get much of a backstory at all, which contrasts largely with the amount readers find out about Victoria's own past. Ford's problems with his past seemed so insignificant that sometimes it seemed like the author game him problems simply because Victoria had problems. I'll admit it made for a cute ending, but it seemed like James thought Ford needed a reason for his commitment-phobia because bachelorhood isn't an attractive enough reason. Personally, I think wanting to stay single is a good enough reason to not look for a spouse in a book, so again, I was annoyed. I'm pretty sure I was in a good mood, even excited, to read this, so I can't blame myself for not liking the book. 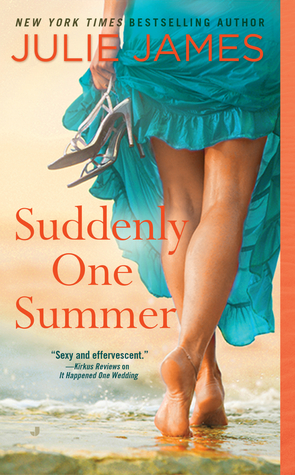 I knew about halfway through the book that I wouldn't end up loving this one; it was quite obvious by then that Suddenly One Summer was more of a cute neighbor romance than one of those love-love-love ones with substance. If I sound like I hate this book, it's only because Julie James is one of my favorite contemporary romance authors, and I had come to expect better from her. This was by no means a bad book - it just wasn't amazing, breathtaking, or any of the other awesome things. If you're looking for a cute, light read, then this might be something you'd be interested in. Source: A copy was purchased for my Kindle.